Tired of lugging a heavy battery around by its carrying strap? Inconvenienced by connecting to it using alligator clamps? Messed up by dew getting the battery all wet? 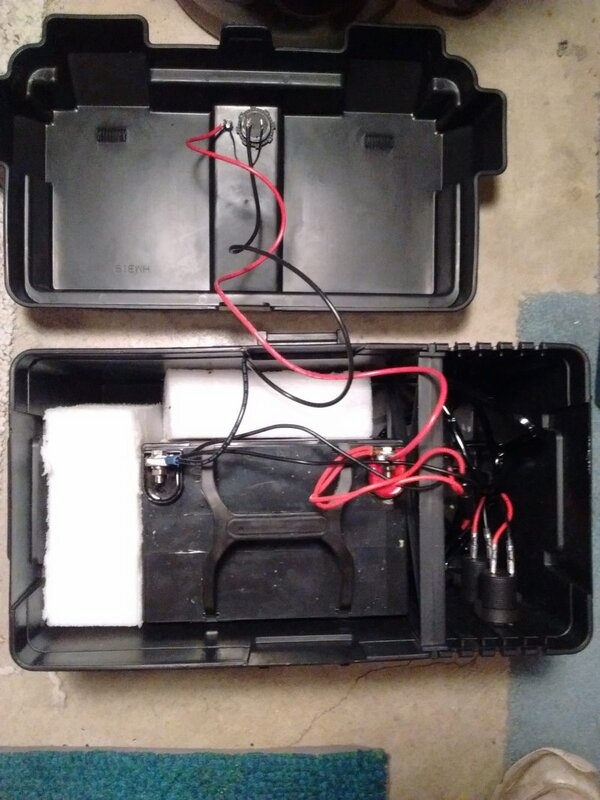 Make a battery box! At the right side under the lid protuberance designed to allow dew to run off are two 12V sockets. I may add a couple more on the far side. Each is individually fused so that if one device blows the rest keep working. The only other thing I added was an LED voltmeter that's actuated by a momentary-on push button. This helps me monitor the battery's state of charge. Sockets are found on eBay for about $6 each. I used waterproof ones that come with their own cables and fuses. I bought the kind that attach with a locking ring; they've been solid in use. The voltmeter (about $4) is also from eBay, waterproof, and also attaches with a ring. Connecting wire. If you run your own wire to the sockets, be sure to use 14AWG or heavier wire, and check that the fuses are appropriate for the wire and devices you plan to connect. Wire to the voltmeter can be much lighter as it will carry only a tiny current. Tools: The only helpful tool you may not have is a variable drill bit that will help make the socket and meter holes. You don't need one as large as the holes--it can be used the start the hole and ream it to proper size. Battery terminals for jumper cables. This should be a deep-cycle battery, and it doesn't like jump starting. A carrying strap. The box comes with handholds at either end. A 35Ah battery and box weighs under 25 pounds, so it's easy to carry. As you can see from the above picture a U1-sized battery leaves a lot of room for accessorizing. An amp meter could be useful to install if you want to measure battery drain. If you have the need for other voltages, add some step-down DC converters. They're small and very inexpensive. You should probably isolate them from any charger, perhaps with a two-way rocker switch. Go wild and add lights and a radio and you have one of the overpriced commercial "power tanks." 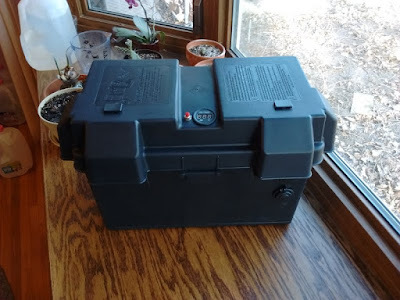 I'll be field testing this battery over the summer at a number of star parties, and may modify it as a result. 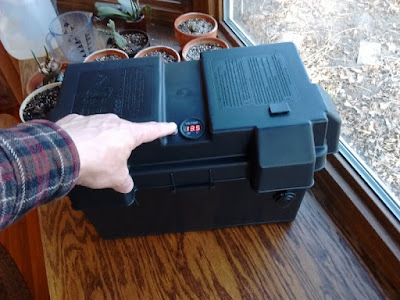 My battery box delivers twice the watt hours of a commercial "power tank," and costs less (about $125 total, $100 of which is the battery and charger).